Nichole M. Fillmore, age 37, passed away April 8, 2019 surrounded by the comfort of her loving family at Newton-Wellesley Hospital. Nichole was born on June 10, 1981 in Brookline. She was a resident of Foxboro for 34 years before moving to Norton. She graduated from the Project Spoke Collaborative in 2001. She loved all types of music and enjoyed many different styles and artists. Nichole will always be remembered for her radiant smile and joyful spirit. Some of her favorite activities were spending time visiting with her family and friends, time spent outdoors and taking rides in her van. She was also fond of social gatherings and celebrations. She was a loving daughter, granddaughter, sister and friend. Beloved daughter of Pennie (Sloan) Marves and her husband Ken Marves of Norton Also the daughter of Ronald Fillmore and his wife Patricia of Bridgewater. Loving sister of Amanda McKeon and her husband Matt of Bellingham, Allyson McDonough and her husband Chris of Mansfield, Jessica Libucha and her husband Nick of Attleboro, Kristie O’Leary and her husband Geoff of Mansfield, Jeremy Marves of N. Attleboro, Jonathan Fillmore and his wife Kelsey of Raynham and Stefan Fillmore of Bridgewater. Granddaughter of Donna Sloan of Marlborough and the late John B. Sloan Jr. and Barbara and Albert Nelson. Also survived by many aunts, uncles, nieces, nephews and cousins. Relatives and friends are kindly invited to attend calling hours on Sunday, April 14 from 1 PM to 4 PM at the Roberts and Sons Funeral Home, 30 South Street, Foxborough. A funeral service will be held on Monday at 11 AM at the funeral home. Interment to follow at Knollwood Memorial Park, Canton. For additional information please contact 508 543-5471. To send an online condolence please visit the funeral home web site at www.robertsandsonsfuneralhome.com. 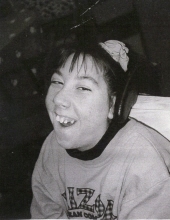 In lieu of flowers, donations in Nichole’s memory may be made to COFAR a non profit organization in Massachusetts who advocate on behalf of individuals with intellectual and other developmental disabilities, and their families and guardians. Donations can be sent to 3 Hodges St. Mansfield MA 02048 or online at COFAR.ORG. "Email Address" would like to share the life celebration of Nichole Mary Fillmore. Click on the "link" to go to share a favorite memory or leave a condolence message for the family.